One-eyed fish vomiting into a fiery sea. ​I really didn't know what pouring vinyl entailed when local musician Daniel Huffman asked if I wanted to sit in on a job Thursday afternoon. I envisioned the act of pouring, and then an actual record, but the in between part was vague. I just said yes and drove over to A&R Records on Riverfront. The owner, Stan, was running around, eying machines, monitoring the output. I got situated on my ladder and started pouring, after Huffman gave me a crash course on how to use the colors I was given to make a psychedelic platter. One of my "early" pieces looked like a one-eyed fish vomiting into a fiery sea. Wait, let me back up. 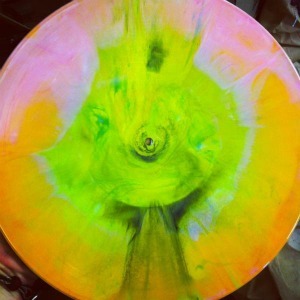 I was helping pour the Flaming Lips' The Flaming Lips and Heady Fwends album out next month, a Record Store Day exclusive featuring collaborations with Nick Cave, Erykah Badu, and Yoko Ono, among others. •Babes 7-inch release from recent signees Icky Blossoms. Color vinyl, limited to 1,000 copies. A side sung in English, B side the same song but sung in SPANISH! •Reverse Vampire 7-inch from Nashville PUJOL. Colored vinyl, also limited to 1,000 copies. At The Drive-In will release a limited edition yellow 10" vinyl version of their 1999 EP 'Vaya' for Record Store Day. 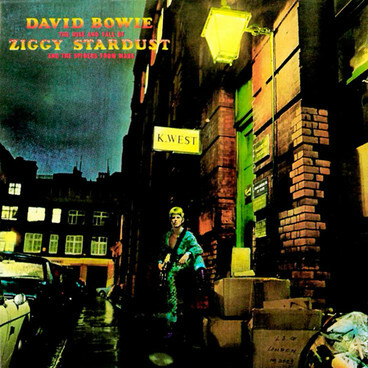 David Bowie has recently announced the reissuing of the seminal 1972 album 'The Rise And Fall Of Ziggy Stardust And The Spiders From Mars;' coming in June. The record, which celebrates its 40th anniversary this summer, will be re-released on June 5 on both CD and vinyl. The reissue will contain remastered audio of all 11 of the album's tracks. In addition, the vinyl includes an audio DVD featuring previously unreleased mixes of some of the album's tracks. The White Stripes are back with the most bombastic album they've ever produced! 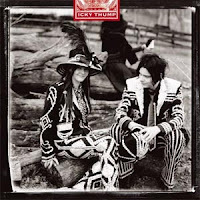 While revealing the band's roots in American folk music, Icky Thump is an explosive, revolutionary assault that brings together garage rock, every blues style of the past 100 years, nouveau, and flamenco. This is truly a modern rock and roll masterpiece! 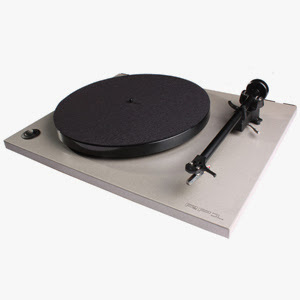 Visit SoundStageDirect for all your vinyl needs! Arguably Japan's first great album, Quiet Life was a subtle artistic triumph that effectively reinvented the band. 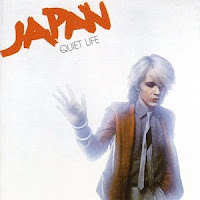 Originally released in 1980, the album marked a dramatic change of style, moving away from the band's earlier Glamrock approach and stepping boldly into an adventurous and sophisticated Art Pop/Art Rock territory that defined its members' music for years to come. 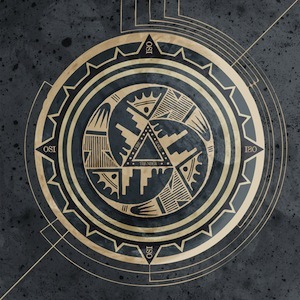 OSI's fourth album, written and recorded throughout 2011, once again reflects the eclectic influences and far-reaching talents of Jim Matheos and Kevin Moore. As with Blood, Fire Make Thunder features Gavin Harrison - who co-wrote one of the tracks with the band - on drums throughout. All other instruments, production and programming were performed by both Matheos and Moore, while vocals and lyrics were handled exclusively by Moore. Very limited Gold vinyl version. 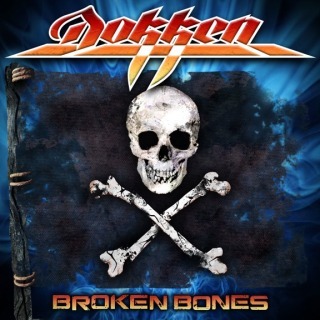 The cover artwork for DOKKEN's forthcoming album, "Broken Bones", can be seen below. The drums for the CD were laid down at MÖTLEY CRÜE drummer Tommy Lee's The Atrium studio in Calabasas, California. A summer release via Frontiers Records is expected. DOKKEN frontman Don Dokken stated in a recent interview about the new album title, "[It]is a metaphor that we all have broken bones, be it from an accident, failed relationship, or a broken heart. Everybody gets wounded as we go through life, but, as they say, what doesn't kill you makes you stronger." 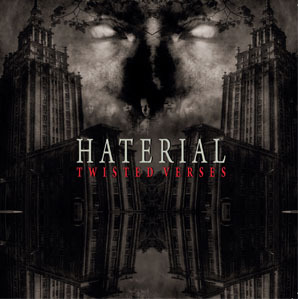 Finnish ultraviolent metallic assault Haterial have revealed the cover artwork (which was created by artist Vesa Ranta) for the band's debut album 'Twisted Verses,' due for release on Wormholedeath at the beginning of the summer. In 1955, Elvis Presley auditions for TV's Arthur Godfrey's Talent Scouts, where he plays "Good Rockin' Tonight". His performance is weak and the show's producers turn him down. In 1956, in Hartford, Connecticut, 11 members of the audience at a concert featuring Frankie Lymon and the Teenagers were arrested for allegedly trying to incite a riot. In 1958, a teenage quartet from Hollywood, California who called themselves The Four Preps saw their first big hit, "Twenty-Six Miles (Santa Catalina)" peak at #2 on the Hot 100. They would go on to place six more songs in the Top 40 over the next four years, including "Big Man" (#3) and "Down By The Station" (#13). In 1959, the Skyliners, a five member group from Pittsburgh, Pennsylvania, entered the Billboard Pop chart for the first time with the now classic doo-wop hit, "Since I Don't Have You". The song will be their biggest success, reaching #12. Joe Rock would later say that he was upset about a girl who had just left him and wrote most of the lyrics while sitting in his car between stoplights. Also in 1959, in Hollywood, Ray Peterson recorded the original version of "The Wonder Of You." In 1960, Elvis Presley released the single "Stuck On You" b/w "Fame And Fortune." He recorded the song during March 1960, and the single was released within weeks and went to number one on the Billboard Hot 100 chart in late-April 1960, becoming his first number-one single of the 1960s and thirteenth overall. "Stuck on You" peaked at number six on the R&B chart. The record reached number three in the UK. In 1961, Elvis Presley recorded "Can't Help Falling in Love." The single is certified by the RIAA as a Platinum record, for US sales in excess of one million copies. In 1964, John Lennon's first book, "In His Own Write," featuring short stories, poems and line drawings, was published simultaneously in New York and London. It was the first solo Beatle project in any form. Lennon's second book, "A Spaniard in the Works," followed in 1965. In 1964, Elvis Presley received his final discharge from the US Army Reserve. He had left active duty in February, 1960. In 1967, the Beatles won the Ivor Novello Award for 1966 for Best Selling Single ("Yellow Submarine"), Most Performed Song ("Michelle") and Second Most Performed Song ("Yesterday"). In 1969, entertainers Jackie Gleason, Kate Smith, The Lettermen and Anita Bryant appear in Miami, Florida at what is billed as the Rally for Decency. Posters for the event warn that "longhairs and weird dressers" won't be allowed inside. Four days later, President Richard Nixon sends a letter of appreciation to the organizers of the rally. 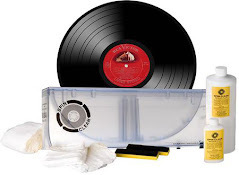 In 1970, Phil Spector took the tapes for the aborted Beatles "Get Back" project to EMI's Abbey Road Studios in London to begin reshaping them into the "Let It Be" album. At the same time in the next studio, Paul McCartney was working on his first solo album. 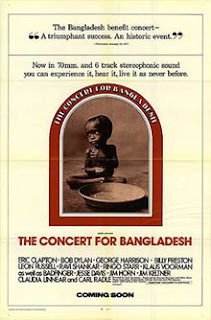 In 1972, the film of "The Concert For Bangladesh," featuring performances by George Harrison, Bob Dylan, Eric Clapton, Ringo Starr, Leon Russell, Billy Preston, and Ravi Shankar, premiered in New York City. In 1973, Paul McCartney & Wings released the single "My Love." In 1973, John Lennon is given 60 days to leave the U.S. by the immigration department. At the same time, Yoko Ono is granted permanent residency. In 1974, Cher enjoys her third, solo, US number one hit with "Dark Lady." It made #36 in the UK. In 1977, Elvis Presley began his final tour at the Arizona State University in Tempe, Arizona. The 49 date jaunt would conclude with his last ever concert at the Indianapolis Indiana Market Square Arena on June 26th, 1977. 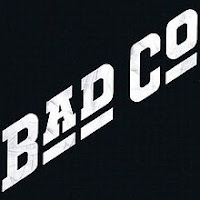 In 1978, the Police signed with A&M Records. Also in 1978, singer and Rock and Roll Hall of Famer Bill Kenny, lead vocalist of the Ink Spots, died of a respiratory illness at the age of 63. 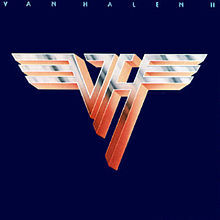 Van Halen II by Van Halen was released in 1979. In 1985, John Lennon's son Julian gave his first concert in San Antonio, Texas. Over the next two years he would place four songs on the Hot 100, including "Valotte" (#9) and "Too Late For Goodbyes" (#5). In 1985, jazz saxophonist John Haley "Zoot" Sims died of cancer at the age of 59. In 1985, former Earth Wind And Fire vocalist Philip Bailey teamed up with Phil Collins to top the UK chart with "Easy Lover," which had reached #2 in the US in February. In 1991, Elton John joined George Michael onstage at London's Wembley Arena for a duet on the 1974 hit "Don't Let The Sun Go Down On Me". The 'live' version will be released as a single and would top the charts on both sides of the Atlantic next December. Michael will donate $500,000 from the royalties to various charities. In 1992, Janet Jackson signed with Virgin Records for $16 million. In 1995, Paul McCartney performed for Prince Charles and 300 invited guests at St. James's Palace in London. The charity show was McCartney's first concert with a string quartet and his first public performance with Elvis Costello, with whom he'd written several songs. In 1999, in Gibraltar, a set of postage stamps was released commemorating what would have been the 30th wedding anniversary of Yoko Ono and John Lennon. In 2008, Neil Aspinall, the Beatles' former road manager who went on to manage their Apple Corps music empire from 1970 until 2007, died of lung cancer at the age of 66. In 2011, the Who's Pete Townshend told Britain's Uncut magazine that he regretted ever forming the band. "What would I have done differently? I would never have joined a band. Even though I am quite a good gang member and a good trooper on the road, I am bad at creative collaboration."